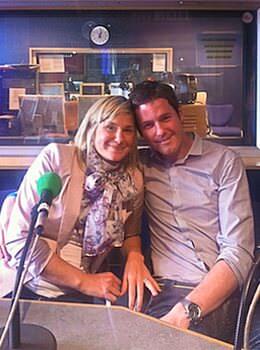 Everyone's favourite race engineer, Rob Smedley, made an appearance on the lovely Lisa McCormick's show on BBC Tees earlier today. Joined by his wife Lucy, Rob talked about the Formula One season so far, his future plans in the sport, and the F1 themed charity dinner that will take place in early September. First things first, Lisa asked him if he was enjoying the summer break, and whilst Rob admitted it was nice to make the most of the few holidays F1 employees get, he couldn't wait to get back to work. We get one holiday about this time of year and one towards the end of the year, after the racing season and that’s it. The rest of the time I’m working. I want to go back to work. Lucy definitely has the hardest part of the deal, because she’s the one that has to look after the kids every day, and I just get to mess around with racing cars every day, go around the world. I go back to Maranello on Monday, and I’ll be in Maranello for three days, then Wednesday afternoon I’ll fly with the team to Belgium, to Spa-Francorchamps for the Belgian GP. Then we’re back on the mill again. Belgium, Italy, Singapore, I can only ever remember three in advance. The questions were flooding in for Rob, but it was to Felipe Massa that the next topic of conversation turned. It's been a difficult couple of years for Massa's side of the Ferrari garage, with no win since that emotional victory in 2008. With an injury and recovery to overcome, the team have been working hard to get back up to speed and get the results coming in but 2011 has not yet delivered. There have been regular points positions but no podium finish in sight as yet. Massa was also out-qualified by teammate Fernando Alonso at every single race, up until the most recent GP at Hungary, where he finally managed to qualify 4th to Fernando's 5th. Unfortunately, the race didn't turn out so well, and Alonso picked up a third place trophy, whilst Massa had to settle for a few more points. Despite all of the above, Rob remains positive about how the season is unfolding, and says that the team don't take any of the media's criticisms to heart. It’s par for the course really, water off a duck’s back. I get stick, he gets stick, he gets more than me obviously, he’s the driver. You read comments that people make, and it’s not the nicest part of the job, but it’s part of the job, you just have to get on with it. I think the main thing about most of the people that work in F1 at that level, they’re all very positive. You just have to keep the momentum going and do as well as you can do. It hasn’t been brilliant, but that’s part and parcel of it. Some years are good, some years are bad. Felipe’s got an extremely strong teammate, definitely one of the best drivers in the world in Fernando. Living with him on a day to day basis isn’t easy, but that’s also positive because we haven’t got someone beside us giving us an easy ride. There’s definitely been more positives this year. He’s had the chance to outqualify Fernando on four or five occasions this year, some of which haven’t happened for various reasons. But we’re getting there. Next, the conversation turned to a subject that Rob was expecting - what would happen if Felipe left the team. Would Rob follow Massa to whichever team he chose next, and where might that be? I’m contracted to Ferrari, not Felipe. We have a good working relationship and I enjoy working with him, he’s a good lad. I think it’s a very easy working relationship, that’s why it’s lasted so long. But Felipe’s his own man, and I’m my own man. I’m contracted to Ferrari until the end of 2012. From what they tell me, they’ve got plans for me, whether they’re good and bad. To be honest, I’m coming to the end of my career as a race engineer. I don’t want to be the oldest race engineer in the pitlane. I’m not at the minute. I think it’s probably gonna be time, towards the end of next year or this year, that I start doing something else. You need new challenges and you need to have a different outlook on things, different responsibilities and whatnot. I think Ferrari are quite happy for me to do something like that... I wouldn’t follow him to a team, I think I’m coming to the natural end of that part of my career, and it’s time to move onwards and upwards. Finally, Rob's wife Lucy Smedley took to the microphone to discuss the upcoming charity dinner they are hosting for Zoe's Place. The organisation helps children up to the age of five who are struggling with live threatening illnesses. It’s a charity, so it relies on the fundraising they can do to keep the place open, so we thought what can we do to help. We’re doing a dinner on the 2nd September, in Beamish Hall Hotel, because we wanted to get somewhere quite big. It’s a dinner with a Formula One theme, basically. Rob’s gonna be talking at the dinner, I’ve made him do that. We’ve also got a guy from Radio 5Live, Maurice Hamilton, he’s going to be interviewing Rob, chatting with Rob. Maurice knows his subject matter really well, so I think he’s going to be really interesting to listen to, entertaining. The two of them are going to be talking about F1. Then we’re going to have an auction, for the auction, we’ve got lots of fabulous money-can’t-buy prizes, which Rob’s been working hard at getting. The prizes include driver overalls, a miniature scaled down helmet signed by Lewis Hamilton, and even, as Lucy admitted, some of Fernando Alonso's underwear. Rob was quick to explain. It’s his fireproof underwear that he wore at the SPanish Grand Prix. Felipe’s given us a pair of overalls. Paul di Resta has given us a pair. We’ve got loads of stuff coming in. A script from the BBC. The German Grand Prix, that Lewis won, there’s only ever two of them printed, Jake Humphrey told me that. Him and all the guys have signed it, DC and Martin Brundle, Eddie and all the people working down there. And Lewis has signed it as well. We’ve got loads of prizes. It’s such a great charity. It’s for kids as well, which really means a lot to Lucy and I. I always say, it’s good to be able to give something back because F1 has been so good to us, with my career and everything else, and it’s great to be able to use that as a vehicle to give something back. And with it being my local area, that’s even more important to the pair of us. The dinner takes place on the 2nd September, and there are a few tables left. Tickets are £35 for a seat at a table of ten. Lucy also added that if anyone is interested in the auction items, but can't get to the dinner, they just need to contact the charity, who will organise bidding on their behalf. There's a lot more information available on the Zoe's Place site. Next post F1 Debrief - Nerd!